Bus from Alor Setar to KLIA is one of the convenient bus service provided by Trans MVS Express. This direct bus service does not just provide convenience to the residents going aboard, but also serve the foreign tourists and travellers going to KLIA airport to catch their flight. 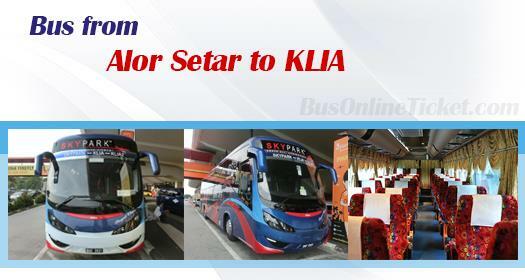 Why Taking Bus from Alor Setar to KLIA? The main reason is because flight fare is much more expensive than bus fare. Second, there is no direct train service from Alor Setar to KLIA. Train from Alor Setar to Kuala Lumpur will arrive at KL Sentral, from there, passengers are required to take KLIA Express to KLIA. Comparing to flight and train, taking bus is always budget and convenient. The duration required for bus from Alor Setar to KLIA is about 7 hours depending on the traffic condition on the departure day. One washroom break will be provided along the journey. Additional break might be given upon request from the driver. The bus fare from Alor Setar to KLIA is at RM 70.00. Though the bus fare from Alor Setar to KLIA is more expensive than the bus fare from Alor Setar to Kuala Lumpur, it does not stop people from taking this bus service. This direct bus service is much more convenient for passengers with many luggage because they do not need to travel to Kuala Lumpur just to transfer shuttle bus or KLIA Express to KLIA airport. The bus from Alor Setar to KLIA departs from Alor Setar Bus Terminal. Passengers who catch the flight are advised to spare more time on the road because traffics is always unpredictable. Bus schedule from Alor Setar to KLIA is limited, passengers are advised to book Alor Setar to KLIA bus ticket online at BusOnlineTicket.com to avoid disappointment. The hassle-free and reliable online booking service in BusOnlineTicket.com is popular amongst local and foreign travellers because it allows you to purchase bus ticket online in anytime and anywhere so long you can connect to internet.